Nicholas Kristof Answers Charges That His Column On Central African Republic Was 'Reckless' : Goats and Soda New York Times columnist Nicholas Kristof wrote the op-ed to draw attention to the country's conflict and suffering. It was criticized on social media for its "shallow" reporting. What's his response? The Central African Republic has one of the world's highest neonatal mortality rates: 1 in 24, according to UNICEF. 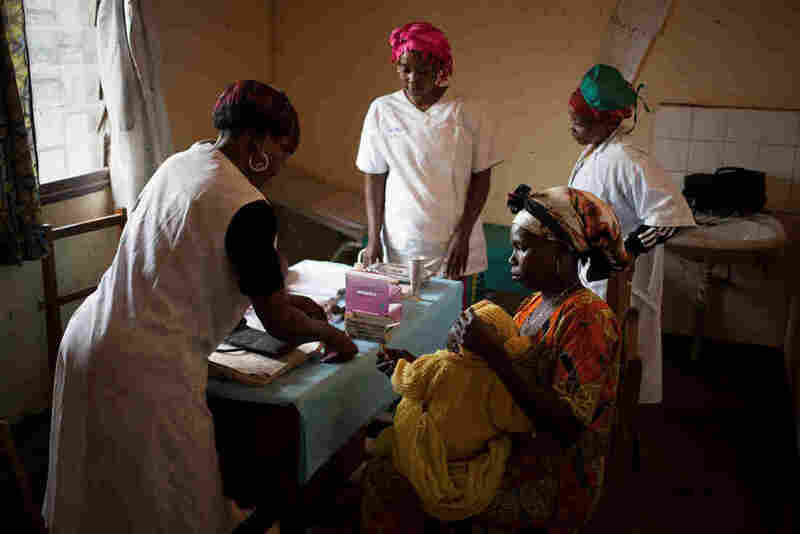 Above: A mother holds her child during a consultation on February 14 at the maternity clinic in the town of Boali. The piece, "Conflict Is More Profitable Than Peace," written by New York Times columnist Nicholas Kristof, was published in the Times on March 25. A two-time Pulitzer winner, Kristof explains why years of violence and conflict in the CAR have created major barriers to alleviating poverty, hunger and preventable disease. Kristof argues that international donors, including the U.S. government, should amp up investments in peace-building efforts like the U.N. peacekeeper budget — not just humanitarian aid. The story was part of Kristof's annual "Win A Trip" contest, where he takes a promising student journalist on a reporting trip to highlight under-covered global development issues. Kristof chose the CAR because it is indeed a country in crisis. It ranks 188 out of 188 in the Human Development Index, which measures such data as life expectancy, education and per capita income. As for the story's intent, in an interview with NPR on Thursday, Kristof said, "I was writing a piece about global conflict as an impediment to development and health care. I was using CAR as an example of that. South Sudan would have been as good an example." Within hours of publication, Kristof's column was slammed in a tweetstorm on Twitter by Knuckey, who has visited the CAR in her research on human rights crimes. Her tweets ignited a conversation across the global humanitarian community. "Kristof represented CAR as if it were miserable across the board, and that the people who live there are victims," Knuckey told NPR. "It represents a brand of journalism that has been heavily criticized for decades, and that is harmful." Kristof himself says he was a "little bit" surprised by the reaction on social media but "understands the frustration that people have with the lack of coverage about things they care deeply about," referring to researchers, academics and aid workers who work to improve conditions in the CAR. For Moussa Abdoulaye, a Central African activist, founder of a community school and consultant for media companies like Al Jazeera, VICE and HBO, perhaps the worst offense was Kristof's depiction of his country as a hopeless place. Kristof described the CAR as "the world's most wretched country," "the capital of human misery" and home to "the world's most neglected crisis." Abdoulaye, who lives in CAR's capital of Bangui, acknowledges the challenges that a journalist like Kristof might face when reporting about his country. CAR is huge, the size of Spain and Portugal combined, he says. Telecommunications are difficult. There are few roads. "It's not possible for any journalist to spend five days here and judge the whole country." Igor Acko, a Central African program specialist for the U.S. Institute of Peace based in Bangui, agrees somewhat with Kristof's characterizations. War and violence has indeed made life in the CAR "miserable," he says. "But it's not the most miserable." "I have seen more miserable countries," he says. "Despite the conflict and the lack of freedom of movement, [hungry] people in the CAR can still collect food, plants and caterpillars, from the forest or bush to keep on living. Compare that to Somalia or South Sudan [where populations are suffering from lack of food from drought.]" Many on Twitter were upset that the Central Africans mentioned in Kristof's story were mainly the poor, helpless victims, not voices of authority. The experts quoted were Westerners from large international aid groups like Mercy Corps and Catholic Relief Services. I do a bit of journalism in Egypt, so I'm interested in one point covered in the critique. Why don't you mention local NGOs and African activists? What is the journalistic merit of omitting those from the story? Since I think I get journalism, I would like your take. Faced with this criticism, Kristof told NPR, "The U.S. announced a big cut in U.N. peacekeeping funds this year. Finding people who can comment on that larger problem, on U.S. policy, that's more challenging." "It's not satisfying," says Knuckey of Kristof's response. "There are Central Africans who work in the human rights space, who are very aware of what would happen if money to U.N. peacekeepers were cut." Others were baffled by some of the facts in Kristof's reporting. Acko, for example, couldn't understand why Kristof chose to highlight the Pygmy population. The article mentioned that a quarter of the country's population has been forced to flee their homes because of the conflict. But the Pygmy people featured in the story were not displaced by violence, says Acko. They live in a forest community in the southwest region that is relatively protected from conflict, which has mostly taken place in the north. "Rebels and armed groups cannot move in the forest to reach the Pygmies," says Acko. "That's true," says Kristof. "But they are representative of people who are suffering from the conflict, which affects lives throughout the country when there's lack of government." Others have been supportive of Kristof's coverage. Sarah as you know we have worked with many local CAR NGOS. I still found @NickKristof piece really useful highlighting the macro needs; namely that we need political, rather than humanitarian, solutions to stop war. For my mind it's the greatest challenge our movement faces. Kristof is trying to get Americans to care about issues beyond our borders (a worthy goal, IMO). You don't do that by telling happy stories of self-determination. Also NYT won't run these. Where will we read them? The stories of people in his CAR story are real & should be told. In an op-ed on the blog Outside the Beltway, James Joyner, a security studies professor at Marine Corps University, wrote, "He's not writing for the people of CAR but rather for an American elite he's seeking to influence. He wants his readership to feel for the plight of the world's poor and to implore their government to do something about it." Still, Joyner wrote that Kristof owes it to his readers to "continue to learn" from experts like Knuckey. Shortly after Knuckey posted the tweets on Sunday, Kristof fired off a tweet in response. "Thanks for your critique," he tweeted. "I think it's well-meant, but I don't think you get journalism any more than I get law." Knuckey and Kristof met at the Times office in New York City to discuss those critiques. As for the reaction in the CAR, it depends on whom you talk to. Abdoulaye says his colleagues — a mix of expats and Central Africans who are activists, lawyers and journalists — were "shocked" by Kristof's piece. "They said he was not professional in the way he gathered his information." But Acko doesn't think people in general are up in arms. "The language spoken here is French," he says. "The New York Times publishes in English. Myself, I was not aware of this article until you sent it to me. "So yeah — there are really few people who have read this article."